What is the Gastric Bypass? The Gastric Bypass is a procedure which entails the rerouting of intestines to bypass the majority of the stomach and duodenum. To achieve this a small stomach pouch is created, and the rest of the stomach is stapled shut. The small intestine is then separated into two sections and the new stomach pouch is connected to the lower potion of the small intestine. The new stomach pouch now leads directly into the lower portion of the small intestine known as the jejunum, and by doing so it avoids the calorie absorption in the upper portion known as the duodenum. The upper portion of the intestine is then reconnected to the lower portion. Watch the animated Bypass video below. What are the advantages of gastric bypass surgery? The major advantage of gastric bypass surgery is the dramatic weightloss it can produce. This weightloss can quickly improve or resolve other health issues associated with carrying serious levels of excess weight. Improving associated illnesses such as type 2 diabetes, high blood pressure & high cholesterol may significantly decrease your risk of having a stroke or a heart attack. Of course, losing excess weight can also improve your quality of life & your ability to perform everyday tasks. Within the first two years of surgery, you can expect to lose 50 to 60 percent of your excess weight3. Gastric bypass is not a miracle however. Losing weight can certainly improve your health however this major surgery will only work if you are committed to the process of changing your lifestyle for good. It is up to you to make the lifelong changes to your eating and exercise habits necessary for optimum health outcomes. Initial Dietitian appointment of $145 which is claimable through your health fund extras cover. Can I have the Bypass if I am uninsured? Dr Reza Adib does perform the gastric bypass on uninsured patients. This is determined on a case by case basis. You will need to have an initial consultation with Dr Adib to determine your eligibility for this procedure. Are there any risks associated with gastric bypass surgery? The following serious risks may be associated with gastric bypass surgery in particular. While these risks are rare they can be life-threatening. Dumping syndrome. This is a condition where stomach contents move too quickly through the small intestine causing nausea, vomiting, diarrhoea, dizziness and sweating. The Bypass procedure is a three night stay in the Wesley Hospital. 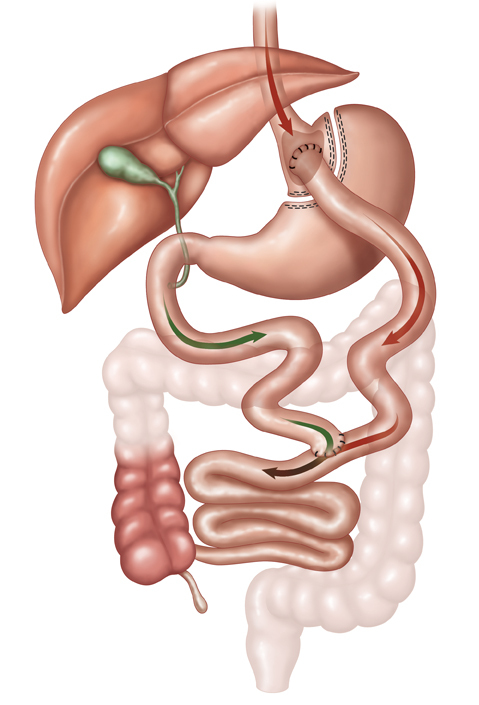 Estimated recovery time for the Gastric Bypass is usually 2 weeks following the procedure, however each patient is different. This is something that can be discussed at the time of your consultation with Dr Reza Adib. Do I need to see a Dietitian? You will be required to see our dietitian, Sharon Rochester, prior to surgery to go through your dietary requirements. The dietitian is conveniently located in our office at the Wesley Hospital and she is also available for phone consultations. You will be required to see her 3 times post surgery, this is to go through your change of diet. You will receive 12 months of complimentary appointments following your procedure. What is the cost of the Dietitian appointment? An initial dietitian appointment is $145 and is claimable through Private Health extras. Patients will receive 12 months Dietitian program post surgery included in their weight loss package. Do I require to see a psychologist prior to having this procedure? Patients do not need to see any specialists prior to this procedure unless deemed necessary by Dr Reza Adib.